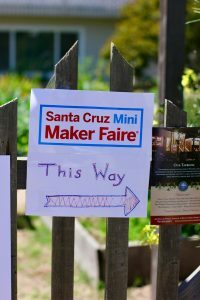 On 29th April I had the good fortune to visit a local Santa Cruz mini maker faire 2017 that was on in my hometown of Santa Cruz. I do love it when fun maker events are on my doorstep! 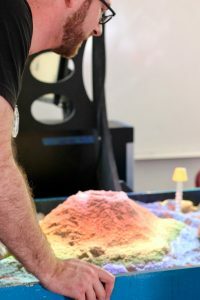 The mini maker event was the 2nd annual faire to be hosted by Zach Roberts, the forward-thinking head of Gateway School, Santa Cruz who is passionate about science in education and nurturing curiosity and an innovative thinking habit in his students. 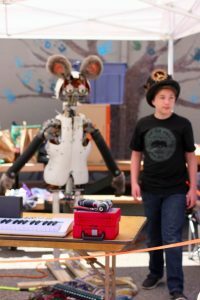 Maker faires are part of a larger worldwide set up run by Maker Media. 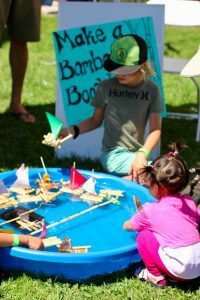 The Maker Faires were launched in San Mateo back in 2005 by Make Magazine, part of Maker Media. 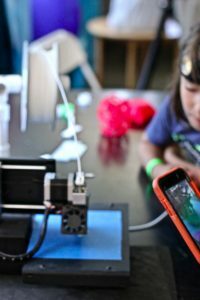 The events have grown in attendance year upon year and last year the flagship Maker Faire at San Mateo saw 150,000 Make enthusiasts pass through their doors. Faires are an ingenious way to encourage innovation and invention through play. It’s under the premise that we all love making things. There were 45 exhibitors in all at the event. A mind boggling array of vendors. There were people shooting off rockets, a marching pneumatic robot with furry bear ears, a sandbox that used colored light to create geographic land and seascapes, a soldering lab that was teaching children to make their own torch. 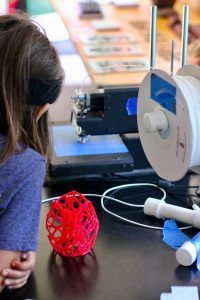 There were 3D printers, printing name tags, and arty creations. Some that really caught my eye that I wanted to share with you. Narwhal Natural. Educational craft kits for children. Takes the pressure off parents to keep having to think of things to entertain their children. Everything you need for the project is in the box. The Lace Museum where showing people how to interweave bobbins to create lace. The patience that requires!!! 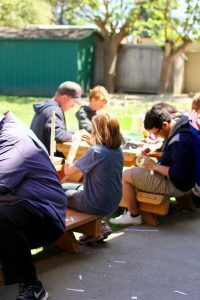 Tinkering Workshops from Museum of Discovery Santa Cruz. 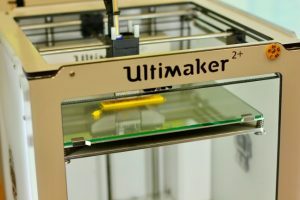 The museum has maker events every day. 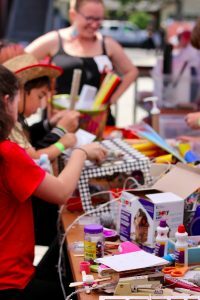 Music, art, science and STEM-related workshops. They were there, getting the children busy. Rogue Reality had virtual reality gaming headgear. Lots of students lining up for that one. Buoy showcased their intelligent device that helps homeowners reduce their water bill while conserving water. The device “learns” the water flow in a household. It computes a toilet flush, a shower, cooking etc. Homeowners can then monitor their water usage, (did you know that toilet flushing uses the most water than any other household activity?) and also be alerted if the Buoy detects a water leak. 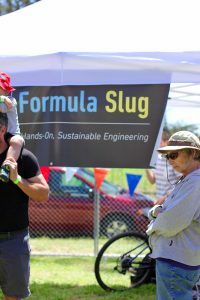 Formula Slug The University of Santa Cruz runs a non-profit engineering organization run by students for students. I chatted with two of them and they told me how they are going to be competing in Nebraska at a national University Formula One type race with their electronic race car. 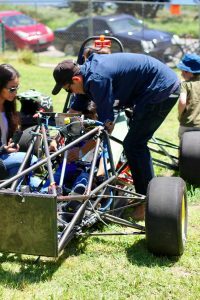 They compete in an engineering design competition in which undergraduate and graduate university students develop and construct an electric racecar. Racecars are inspected for rules compliance and are judged on student design, cost and sales presentations, and their on-track performances. Their pride in what they’d created was palpable. Idea Fab Labs were full of ideas for makers to explore. 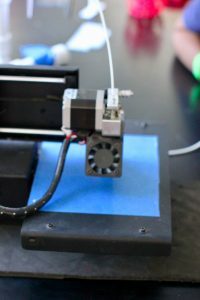 Their 3D printer was whirring around, pulling in the reel of plastic cord to build a creative piece of art. 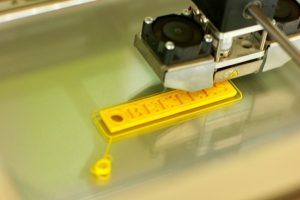 They have a maker space membership that offers Laser Zone, 3D Printing & Scanning Zone, Woodshop Zone. A real creative, community hub. 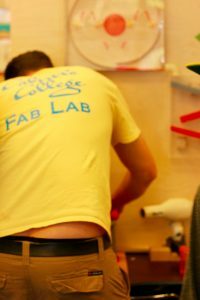 Cabrillo Fab Labs had a host of digital art fabrication machines to learn about. 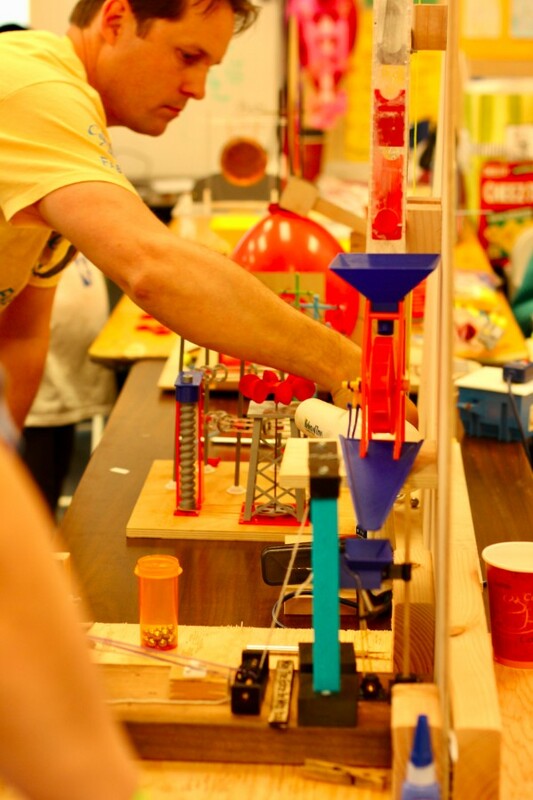 The large photo above is a Rube Goldberg Machine created by the Cabrillo College students using 3D printers. Each component was designed and fabricated by a different student. Once placed together they created a Rube Goldberg Machine course for silver balls to follow. To hit things, move things, push things and knock things down. So fun. They have student and public classes at the college in this Maker genre. The strange looking contraption in the image above -299 Brynhilder. Is the work of genius robots by Team Valkyrie. Thirty-seven of them recently formed the team to become part of the FIRST organization. FIRST is an organization which helps spread STEM and robotics within the community. 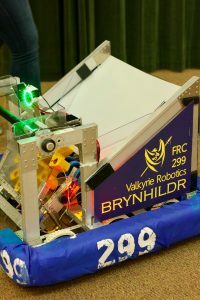 Every year the team participates in the FIRST Robotics Challenge in which the team has to build a robot based on a challenge revealed by FIRST. Valkyrie not only teaches high school students complex subjects like engineering and advanced physics but also strives to spread STEM in their community. The Tower Dome. 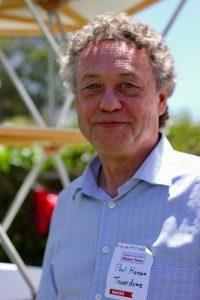 I spotted the airy, lofty structure from across the school yard and headed over for a chat with the inventor, designer, engineer of the Tower dome, Paul Hansen. Paul had long been obsessed with the architectural and environmental ideas of Buckminster Fuller and his geodesic dome. After attending a conference where Buckminster spoke decades ago Paul could not get out of his mind an idea to build the domes more than at ground level. 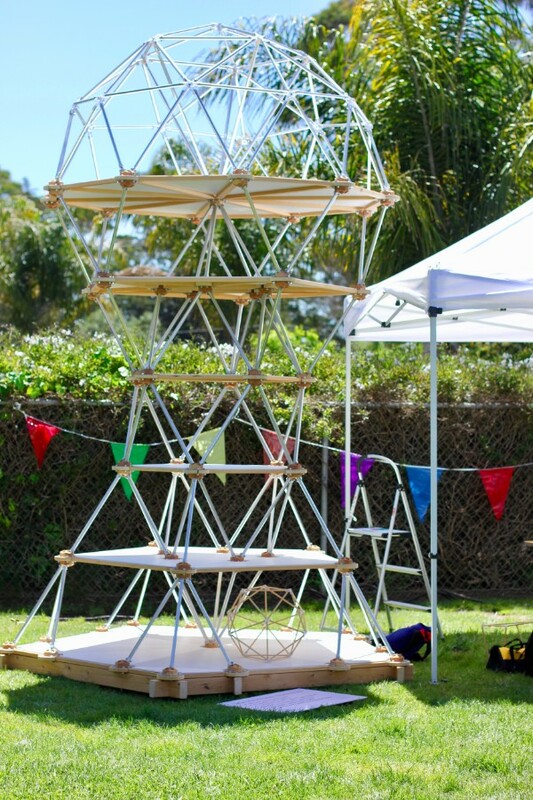 He wanted to build the structures upwards to conserve land. 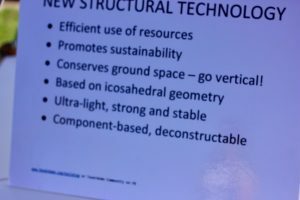 It was 35 years later while Paul was playing with an educational building set with his grandson, that he finally figured out how to build vertically using the synergistic building principle rather than the energetic, four sides architecture that is ubiquitous today. Paul is a man on a mission to build a community and get funding to bring his ideas to life. His website explains his ideas in more detail. 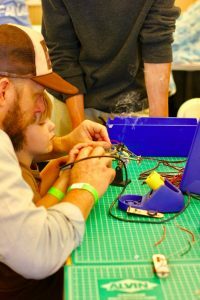 It was heartening to see so much dedication to the education of science, technology, engineering and math in our children and young adults at the Santa Cruz Mini Maker Faire 2017. And for it to be fun and encouraged in the community. 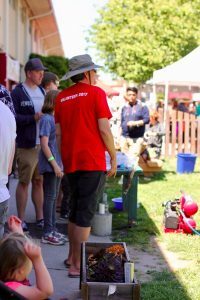 The flagship Maker Fair at San Mateo is coming up on May 19-21, 2017. Will you be there? UCSC Formula Slug. Sustainable Engineering.